Five stars! Hilton hotel in Chengdu, Fume purifier Installation Project. It is a five-star hotel opened in Chengdu by Hilton hospitality company, a world-renowned star hotel chains. It is also the 30th Hilton Hotel in China. The hotel's facilities are abundance, including 395 rooms, 1,650 square meters spacious multi-functional meeting rooms, 5 specialty restaurants, which banquet halls is big enough to acceptance more than 320 guests, 420 square meters large indoor pool, and a variety of recreation rooms, such as tea rooms, chess and card rooms, lounges, gyms, etc. In order to create a five-star service scene, the hotel also made a lot of effort in the dining and ventilation system. A 120,000-volume electrostatic fume purifier GJESP-1200 and UV light-deodorizing equipment GJUV-1200 purification system was installed for it ,with a purification rate of 98.4%. The fume purification equipment is a renowned brand of fume purifier which highly recognized by the domestic catering industry. Gojek team has been independently researched and developed more than 7 years.with the advantages of high efficiency, low energy consumption, high safety factor and low failure rate. 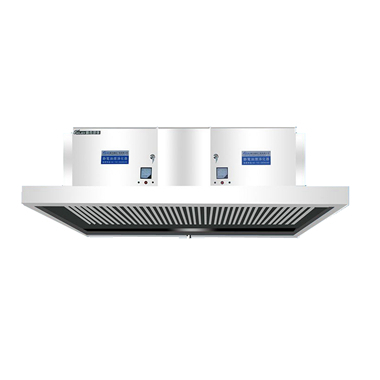 The electrostatic fume purifier is one of the most cost-effective equipment in the country and owned high reputation in the catering industry. Through the fume purification system, the catering kitchen fully meets Chengdu's high standard catering fume emission regulations, which not only creates a fresh and clean leisure environment for the hotel, but also protects the living environment for the surrounding residents, meet the environmental requirements of international five-star hotels.